There have been numerous landmark events in music history that have made certain years seem more significant than others, such as the death of Johann Sebastian Bach in 1750, which signified the end of the Baroque period, or the dawn of the jazz era following the release of the first Original Dixieland Jazz Band album in 1917. And who can overlook British pop/rock’s global takeover following the Beatles’ 1964 debut appearance on American television? Forty years ago the passion and presence he displayed with the Police locked the drum world on his every move. Today, after exploring a multitude of ways in which to express and employ himself through sound, he’s focusing once again on a band setting. Longtime MD contributor Ken Micallef remembers the shock of the new and learns about the drummer’s return to old-time rocking out. Growing up in the Hartford, Connecticut, area with musically inclined parents, Jimmy Macbride caught the jazz bug early. He eventually moved to the big city to attend Juilliard, where he studied with the master drummers Carl Allen, Kenny Washington, and Billy Drummond. It was there where old and new records were heard, skills were honed, and relationships were formed. By his own admission, Jim Mola moved to New York in 1985 to set the world on fire as a drummer. Now, after thirty-three years of experience in the trenches as a working musician, the types of gigs he’s playing align exactly with what he hoped to be doing at this point in his career: regular session work, frequent gigs in speakeasies, bars, and small clubs, and a busy career as a clinician and educater including a faculity position at Manhattan’s famed Collective School of Music. At the dawn of the ’70s, music fans noticed the credit “Drums: Russ Kunkel” popping up on reams of LP jackets. From that pivotal point, Kunkel’s momentum as a session ace surged through five decades. The drummer’s tasteful parts and elegant time pocket earned him A-list status in L.A.
“I was blessed to land a gig as life-changing as Foreigner,” the London-born drummer Dennis Elliott says. “It was a band I totally believed in.” Elliott played with the group for seventeen years, powering solid-gold tracks like “Urgent,” “Feels Like the First Time,” “Hot Blooded,” “Waiting for a Girl Like You,” and “Double Vision” with flair, soul, and efficiency. "When we were planning our solo albums, I knew I might never again get the chance to do what I wanted, with horns and strings and singing. I’m a soul singer; I grew up with James Brown, the Ronettes, the Rascals, Phil Spector, and the Motown sound. I understand now why the fans and even the guys in the band didn’t really get it." For the drummer, who’d built a sterling session and live career for nearly ten years with artists including John Lennon, Paul Simon, Jim Croce, James Taylor, and Steely Dan, 1978 was yet another super-busy year. In the studio, on the road, back in the studio, back on the road…it’s no wonder the circumstances surrounding some recordings are somewhat vague to him today. That said, the studio star actually remembers quite a bit about the records he made that year; here he shares his impressions of a dozen. Listening to the albums that put Heart on the map in the ’70s, like Dreamboat Annie and Little Queen, it’s clear the band members were students of Led Zeppelin—and that drummer Michael Derosier was the star pupil. Over the previous decade he’d injected jazz and classical concepts into pop and rock music with Yes and King Crimson, in the process breaking down barriers to what drummers could achieve in progressive music scenarios. By ’78 he was framing bold new musical vistas with his own self-titled project—but still having a go at “supergroup” potentialities with U.K. MD caught up with the famously deep thinker to find out…well…exactly what he was thinking. In this article and subsequent ones in a series, we’re going to survey the various types of plastic-based drumheads available for each component of the kit to help you zero in on which models will get you closest to the sound and aesthetic you’re trying to achieve. We start by focusing on the largest and often most important voice on the drumset: the bass drum. 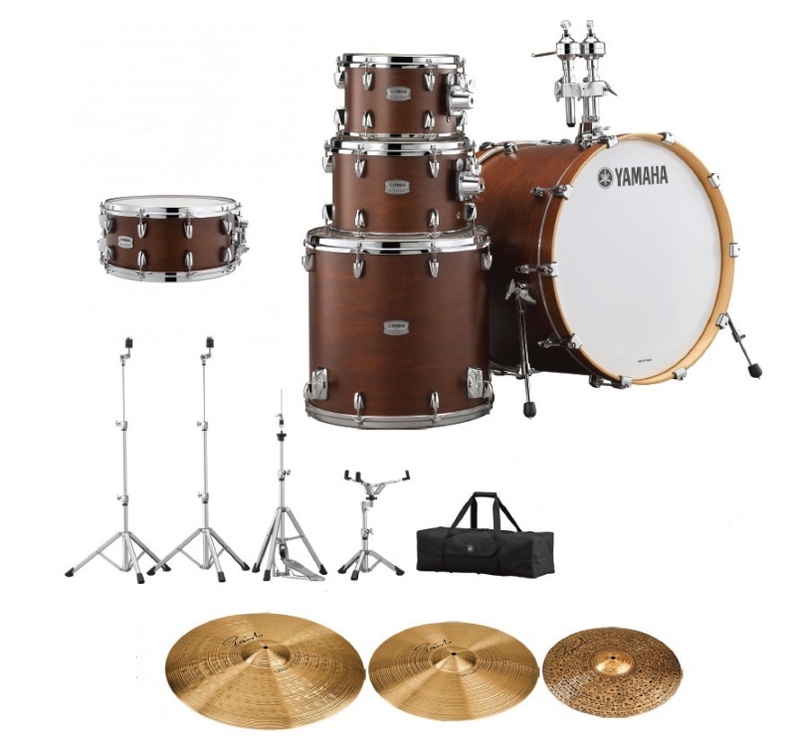 New and Notable - New Drum Gear From Tama, Remo, SJC Custom Drums, apulSoft, U.S. Drum Supply, Basal, and Vater!